Stencil Girl Products is ecstatic to introduce our latest Stencil Designer! 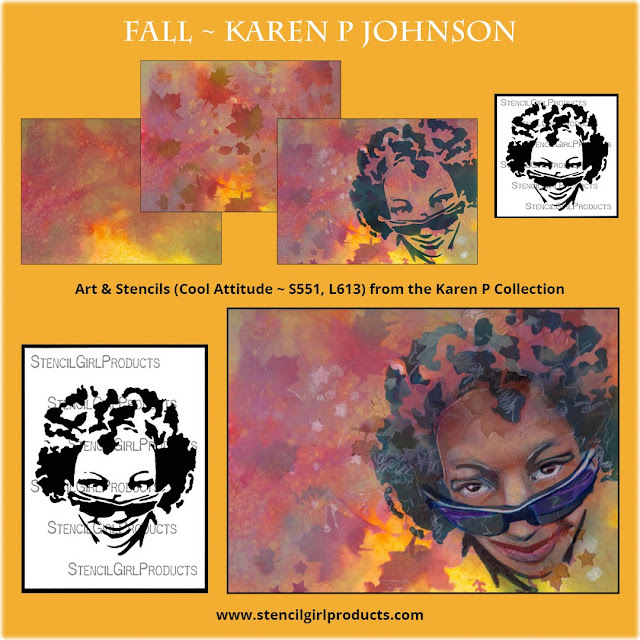 It was at an art retreat when Mary Beth Shaw first came face to face with Karen Johnson's compelling colored pencil art; Mary Beth instantly knew she wanted Karen as a stencil designer. It took several years of convincing, but Mary Beth is nothing if not persistent. 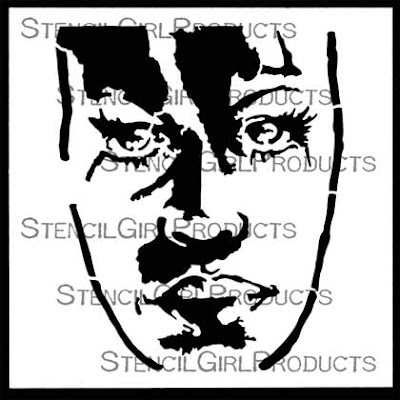 The women of the Karen P Collection fulfill often requested stencils and StencilGirl products is delighted to finally bring them to you! 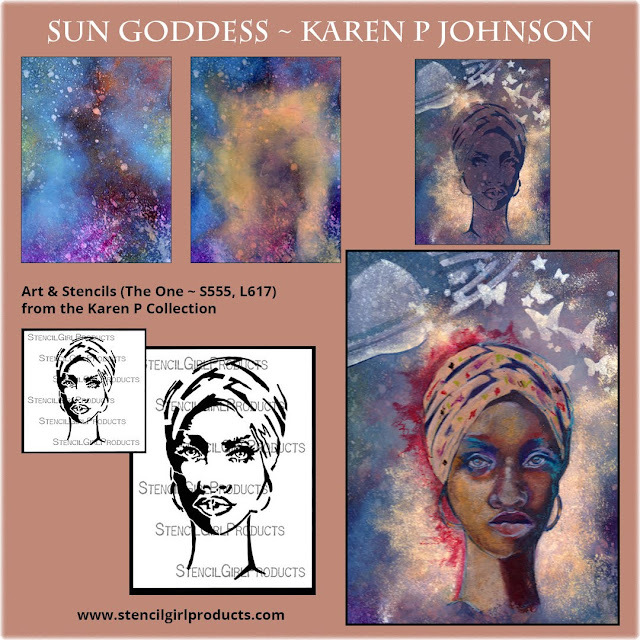 Karen P Johnson is a Graphic Designer/ Illustrator born and raised in Wilmington, Delaware. 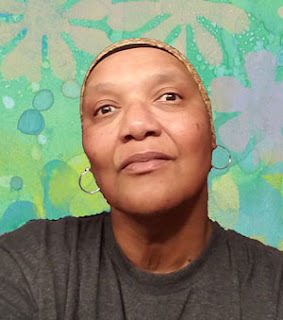 She came to Columbus, Ohio to attend The Columbus Collage Of Art and Design where she received a Bachelor's Of Fine Arts Degree in the Division of Illustration. 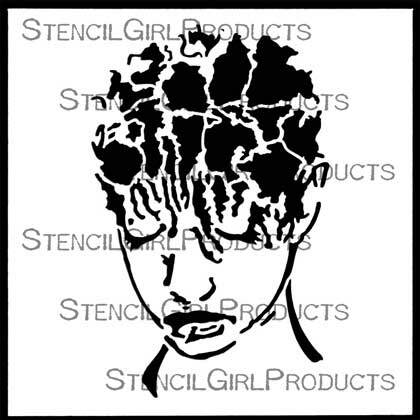 Upon graduating she worked as a Paste-up Artist for Merrill Publishing. After leaving Merrill, she began her career as a designer. She continues to design as the opportunity arises. She is always the most happy when she is covered in paint. 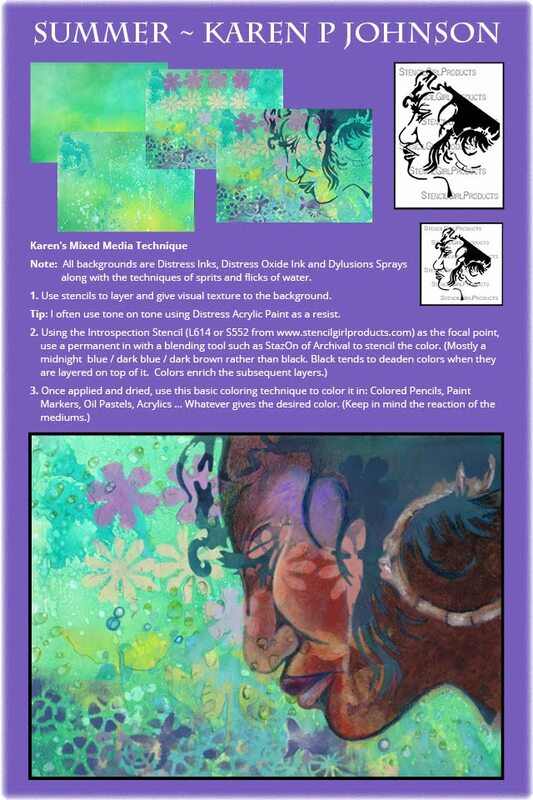 The many facets of women, like the cut of a gem, are revealed in the 7 faces that comprise the Karen P Collection. 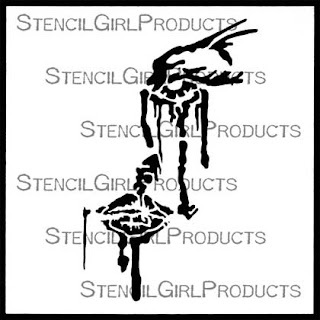 Karen's inspiration for these stencils comes from The Forces Of Nature, which embody the essence of uncompromising women who refuse to be defined. 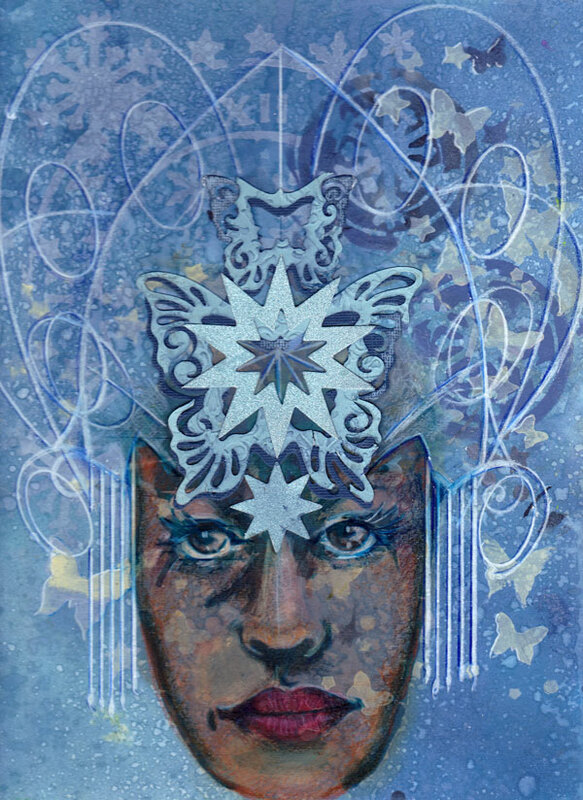 Face It - Let's Face It, whether it is the shortest day or the longest night, the Queen never looks back nor looks away. 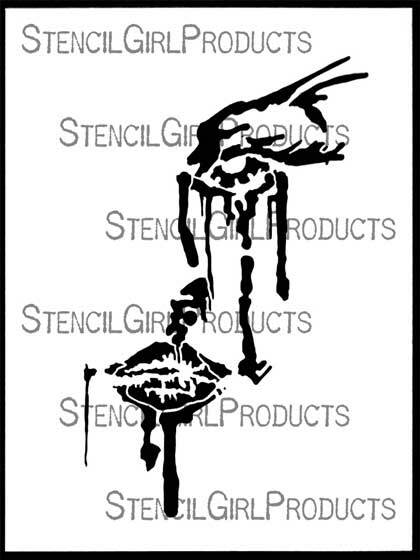 Cool Attitude - Fun Loving, Flirtatious, and Flying High, no one knows what hides behind a pair of shades; the eyes have it. 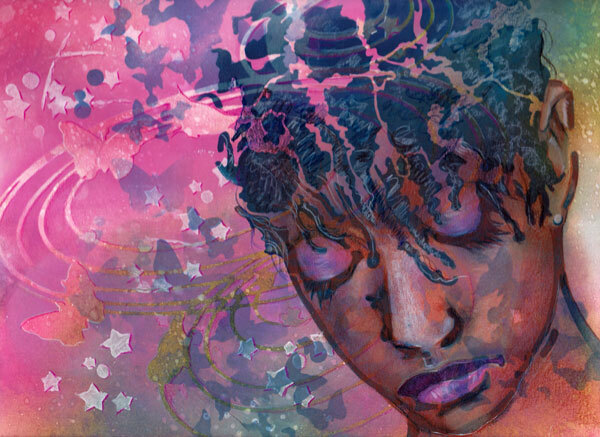 Ms. Nik - The young woman, pensive, discreet, is not afraid to live within the silence. The One - You may never know her name. Once you see her you will never forget. Your heart will always describe her as The One. 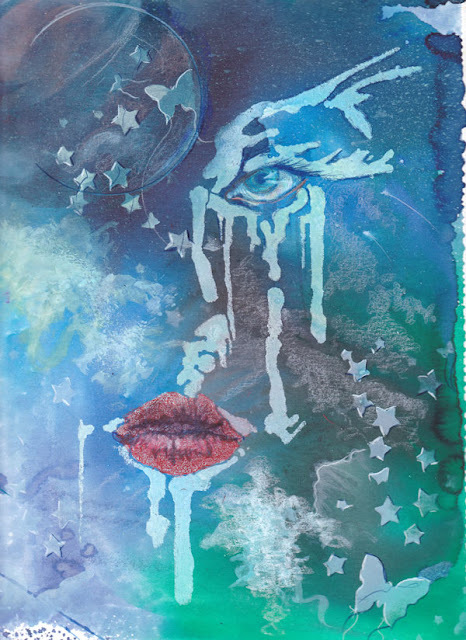 Drip Face - Born from the abstract pooling of liquid gravity, drip face is always watching. 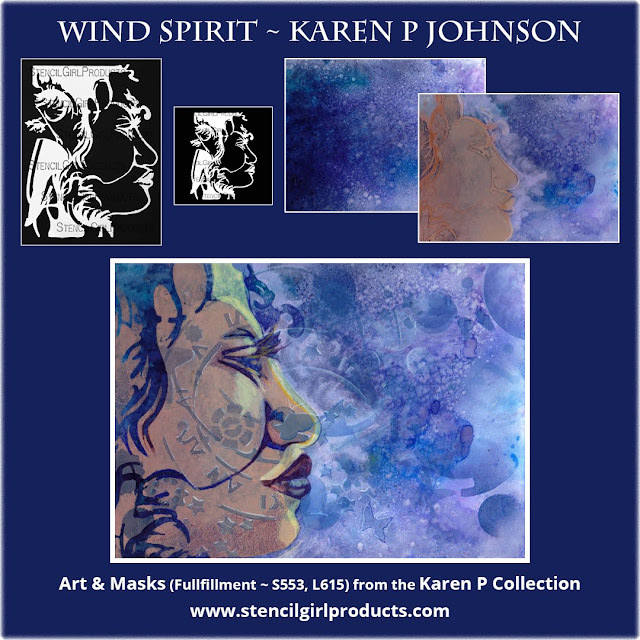 Fulfillment - (mask) Fulfillment is contentment at the completion of a task, gratification at the achievement of knowing the answers are correct or simply, that "Life Is Good." Introspection - Your heart knows the answer. Introspection is a stencil to use when you wish to express, "The Answers are within." Just gorgeous! On my wish list immediately! 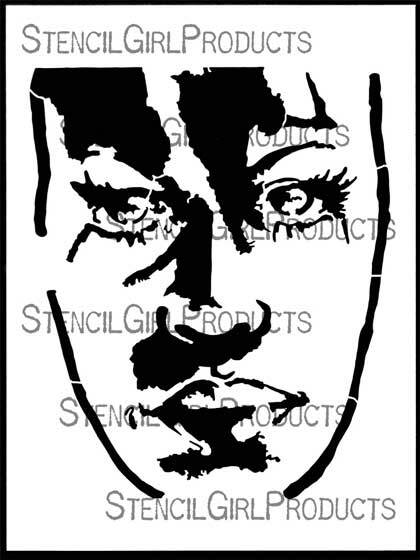 Inspired stencils and the work you did with them is, as Jill McDowell already said, dramatic and compelling. Congratulations! These are fascinating. 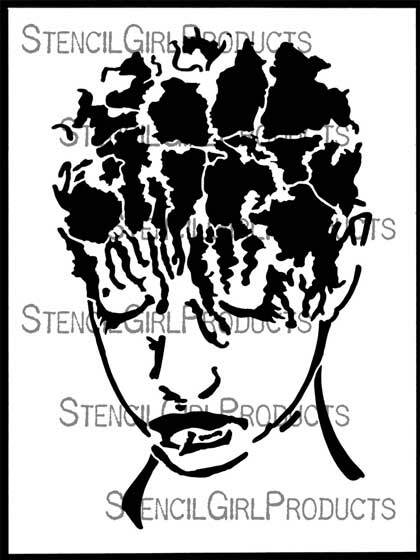 What a great addition to the StencilGirl family.